That is one excellent question. I started thinking, I haven’t made much money off my LinkedIn posts, my Facebook Live videos, my public speaking, or all this blogging. Or, have I? Hmmmm… when, I thought about Edward’s question. I came up with four different ways I’ve monetized, or earned money from, thought leadership. There are probably more, that I haven’t thought of yet. So, if you can think of any I’m missing, and don’t mind sharing with the universe, go to the Comments section and PLEASE spill!!!! 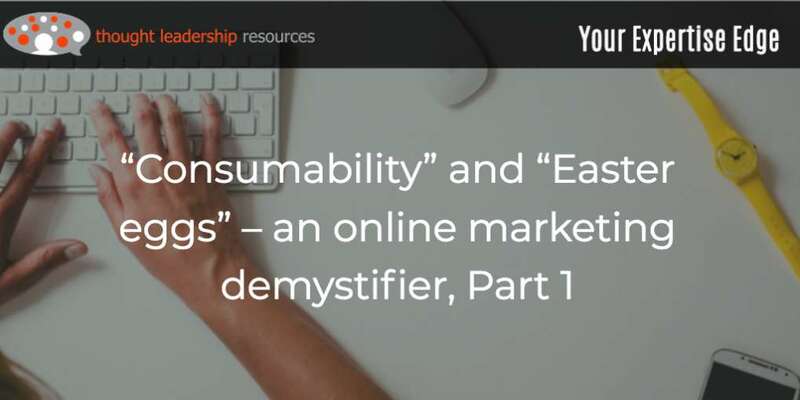 Just don't get the idea that the only way to monetize your expertise is through what everyone thinks of from the start -- selling online courses, books or other products. There’s waaaaay more to it than that. Listed below, are my four ways you can earn money from thought leadership. Which of these work for you, and which haven’t you tried yet? 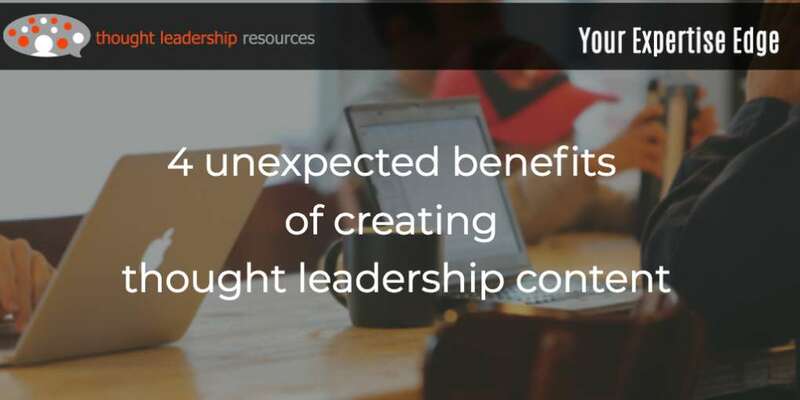 The first way to earn from thought leadership is one that I was using even before “thought leadership” was a thing. Back in 1999, when I’d just recently jumped out of the best job I’d had to date (manager of media relations for the Canadian firm within the global giant KPMG) to set up my own business, I was looking for clients. So I booked a speaking gig in Vancouver, which is almost on the other side of Canada, the world’s second-largest country. 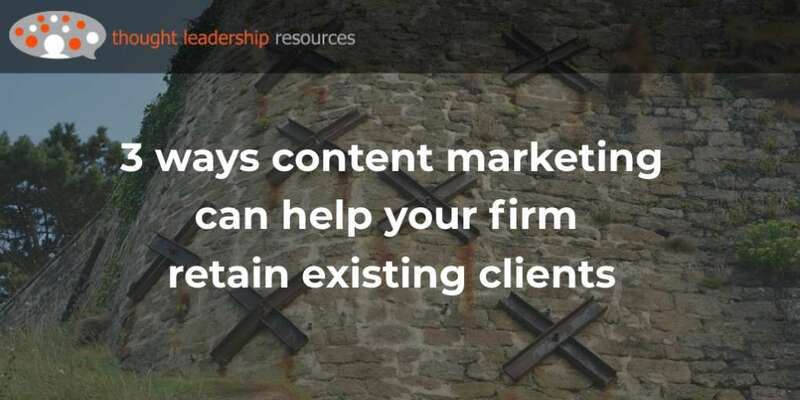 But I thought it would be worthwhile – in the audience would be people who do marketing for professional services firms, which was exactly the sweet spot of people I wanted to have as clients. After the speech, I talked with two heads of professional services marketing who’d heard me speak. Both were with engineering firms I’d never heard of before – although one is a specialty firm that operates globally, and the other was a national engineering firm. Both firms became my clients. Back-of-the-envelope calculations indicate that in the nearly two decades since, I’ve earned close to C$1 million from just one of those firms, in consulting fees and salary (I was on staff for three years). That’s a pretty good ROI from one speech. It’s also worth noting that I’ve given dozens of other speeches all over the USA and Canada, and received no discernable outcome from most of them. But one speech was worth it. I’ve also received clients who found me through online search, or through receiving this blog on a regular basis, reminding them that I exist. 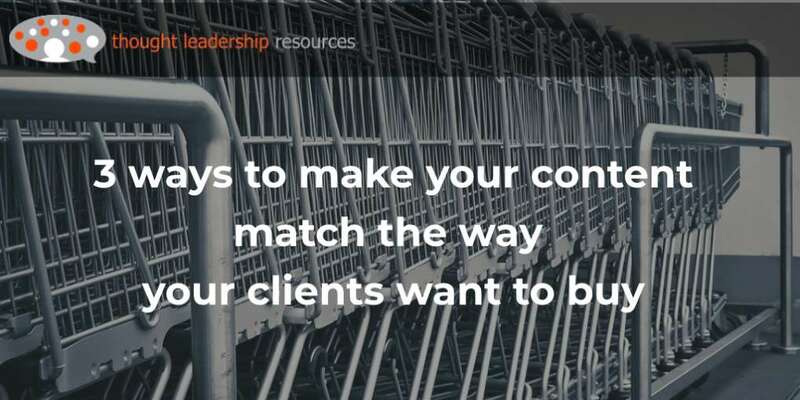 In getting your content into more places, it’s likely to be seen by more people, and those people will contain those who need what you’re offering. That can include anything from a blog post that contains the right SEO elements, paying to boost a post or a Live video on Facebook so it’s shown to more people, or a guest appearance you’ve made on a podcast that has a large base of subscribers. As a result, more people are likely to hear your message and be interested in what you have to offer. You have opportunities to make business development presentations to more potential clients. 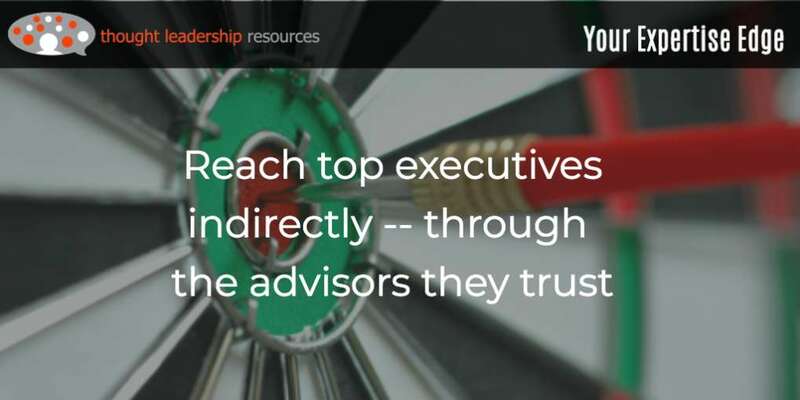 You have a higher degree of credibility with the people you encounter, or who reach out to you. This makes it more likely that you’ll be successful in your proposals, compared with competitors who don’t have that credibility. You can charge a higher rate. Watchmakers that build premium positioning through ads in upmarket publications can charge higher rates for their products, than can companies that sell in pop-up booths in shopping malls. 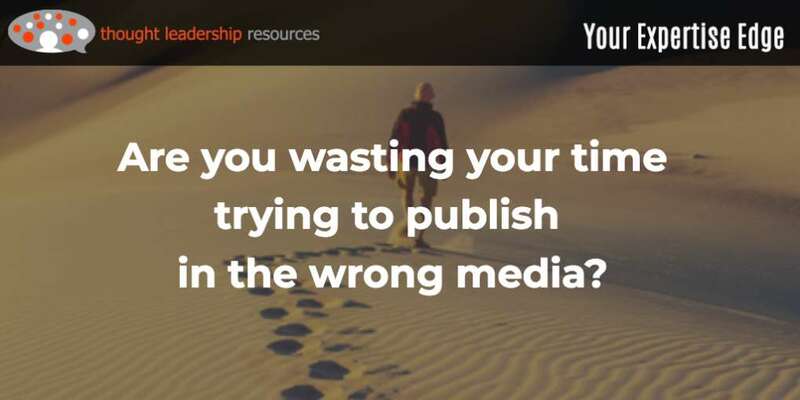 It’s the same for you – if you have high name recognition, and have demonstrated your expertise through content creation, you’re able to charge more for your time. It’s a sweet place to be – more likely to get the work, and more able to set your own fees. 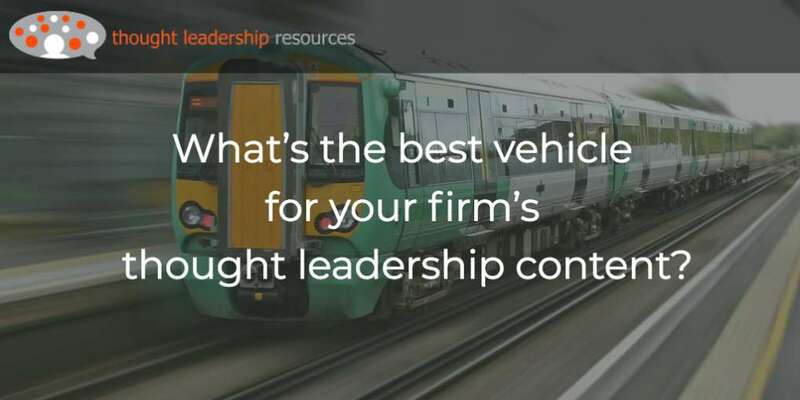 To get the benefit this aspect of thought leadership offers, start by getting a clear idea of who you want to influence – like, who do you want as potential clients? Then, go to where they’re looking. 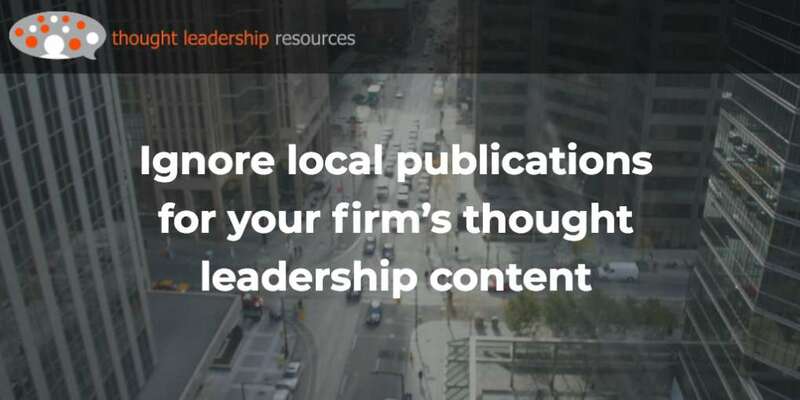 Publish content in their business media – on their association websites, in their professional or industry media, and in their LinkedIn groups. Do presentations at their conferences and do guest appearances on their podcasts. Use the keywords and terms that they will be using, which may be different from those you’re accustomed to using. 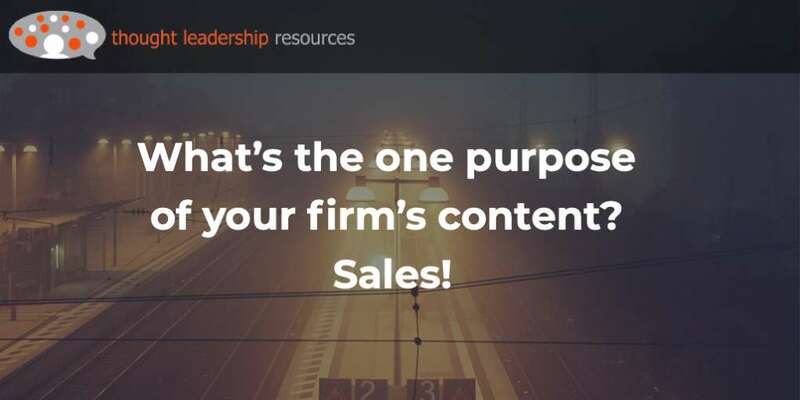 The second way that thought leadership content helps you is if you’re interested in doing better at full-time paid employment. The same credibility that attaches to a consultant who is known as an expert in their field also attaches to a potential employee. Someone who is active in their professional field, creating original content and giving speeches, gets noticed for potential new opportunities. They’re also seen as the safe choice, both by the individual doing the hiring and by anyone else touching the decision. And, the candidate has a stronger bargaining position regarding wages, than someone who doesn’t have that halo effect. To do this, consider the associations that your organization belongs to – perhaps industry associations – and present yourself as a potential guest speaker. Get active in you own professional organization – accounting, law, consulting or whatever that is. Get seen as a leader in that context, and you’ll have more opportunity to move up the ladder in your own organization. The speech I gave in Vancouver was a no-charge speech; the organization I spoke to was low-budget and was not set up to pay speakers a living wage. Most of the speeches I’ve given since have also been on a no-cost basis. That’s because my objectives in speaking are to provide useful information, to impress some potential clients with how I may be able to help them, and to meet prospective clients in person. That makes it worthwhile – provided the audience has enough potential clients. 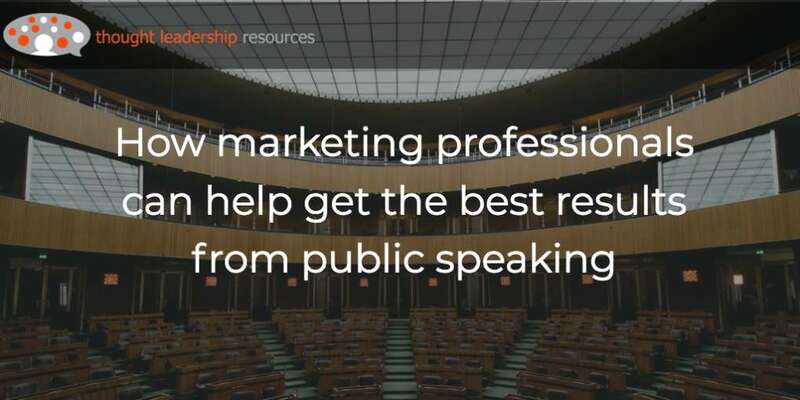 By the way, see Post #39 to learn about four benefits public speaking offers you. Speaking for free opens up many more opportunities to speak than if you limit yourself to venues that will pay, so I’m happy with that tradeoff. But I get it that there can be some good revenue in public speaking. I’ve earned revenue from workshops and how-to presentations, but the bigger money is in conference presentations and particularly keynotes (I’ve done just ONE of those). Thought leadership helps with that. To see why, put yourself in the position of a conference organizer, who needs to fill a keynote slot or an opening or closing plenary session. She’s faced with two possible candidates. Both are qualified as regards knowledge, plus academic and professional certifications. She’s seen speaker videos for both, and they both work. But one of the speakers has published a book, has written articles for her industry’s publications, and a big following on Twitter. She’s put some well-thought-through but just-a-bit-controversial posts on Medium. In short, she’s got awareness among potential attendees, and some may come to the event just to see her. More to the point, our meeting organizer needs to convince members of the organizing committee that she’s put together a sound lineup of speakers – and being able to point to this speaker’s tracks online will make that meeting go more easily. 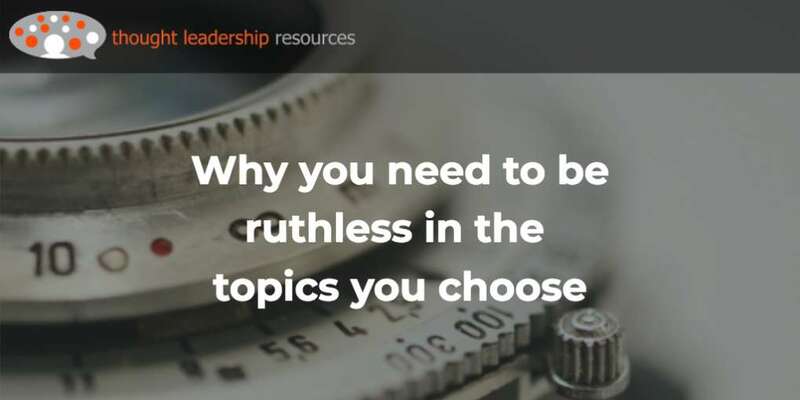 You can see how having demonstrated thought leadership can be more likely to get you considered as a speaker, more likely to get a keynote slot, and paid better. 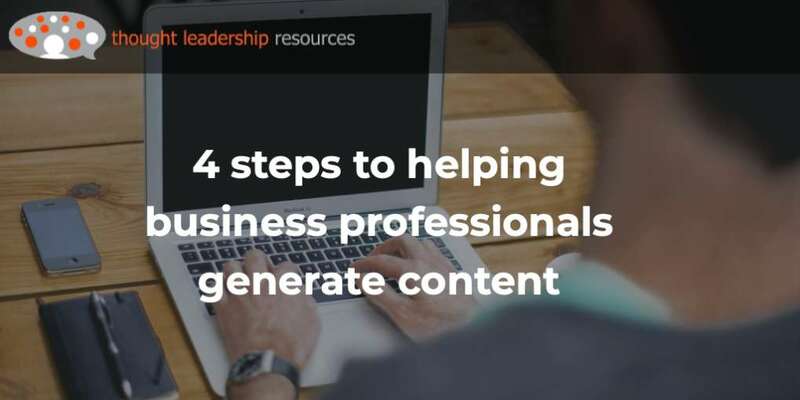 To do this, be sure that your content is in any place on the Internet that conference organizers may be looking – on your LinkedIn profile and on your website for sure. Provide information that conference organizer would want to know – the information normally provided in a one-sheet such as your location, the topics you speak on, and why they should book you. 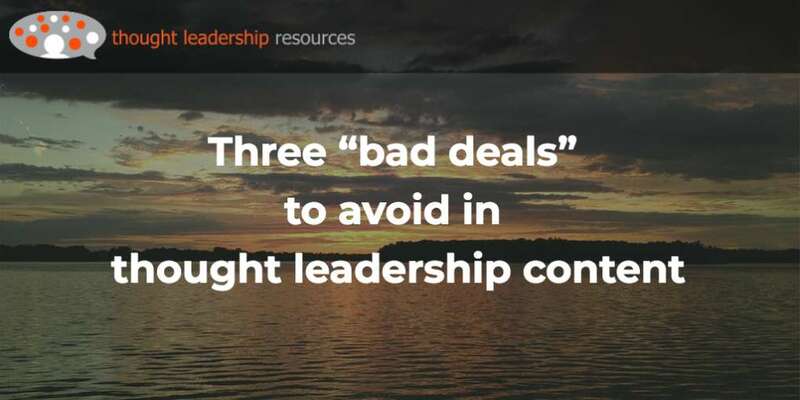 The fourth and final way to make money from thought leadership is through selling virtual and physical products. 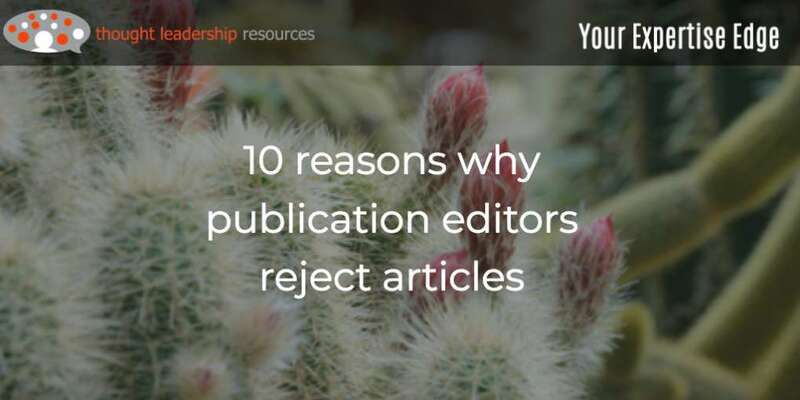 These include online courses (such a one that I’m offering, “Get that article published!” -- just sayin’), e-books, templates for PowerPoint and Keynote slides, and videos. You can also sell coaching, individual instruction, and memberships in Mastermind groups. The most common physical product is a book (I’ve got two on offer), although I know people who still sell CDs and DVDs. My books are sold via Amazon, so I don’t need to mess with fulfillment. And there are lots of online solutions like Square and Shopify that make it easy for you to set up an online store for other products. Then there’s the old selling-books-at-the-back-of-the-room option for speakers. You can make an arrangement with organizers that some of your books will be given away as door prizes. Or, each attendee gets a copy, included in the admission fee. 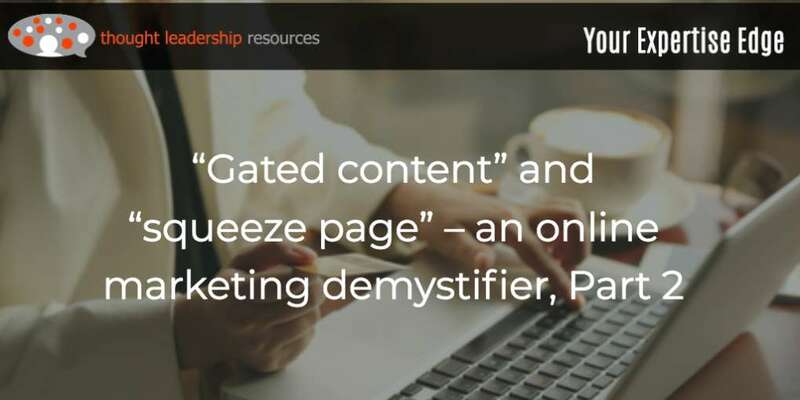 One of the current favorites for building a sales funnel for your products is webinars, generally offered for free, with a gentle or not-so-gentle sales pitch for your products at the end. The idea of a free webinar to help sell a physical or electronic product is an example of how this all works together. 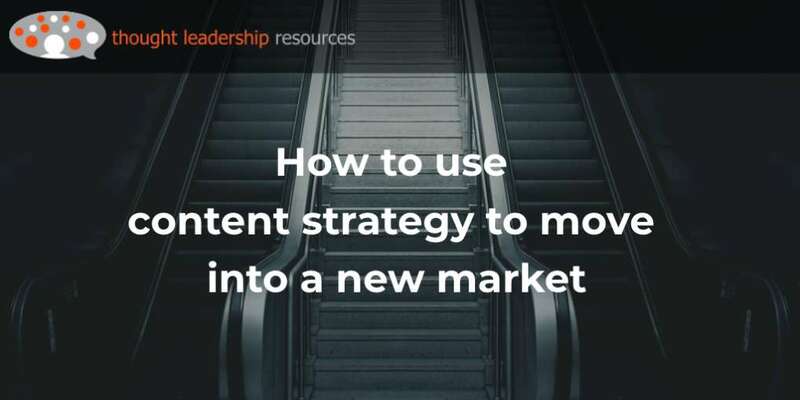 The webinar must contain genuinely useful information, or people won’t attend, and won’t stay long enough to see you as someone with insights that can help them – or stay long enough to consider buying your products. In addition to that, they’re not going to show up for your webinar unless they’ve already heard of you, maybe through some of your Periscopes or Facebook Lives; maybe your blog or a speech you’ve given. Subsequently, these four ways to earn money aren’t an either-or. You don’t have to pick just one. You can use all of them. This honors the learning styles of all your potential clients and customers. For example, I’d rather read a blog post or an article than watch a video, unless the video is of a how-to nature where seeing is understanding. Which you choose to focus on, that’s another question. It might be based partly on geography. If you live on Norfolk Island in the South Pacific Ocean, public speaking might not be best for you – just too much trouble and expense to get to events. But if you’re in Norfolk, Virginia, it’s a lot more viable in that you have millions of potential customers just a couple of hours’ drive away. 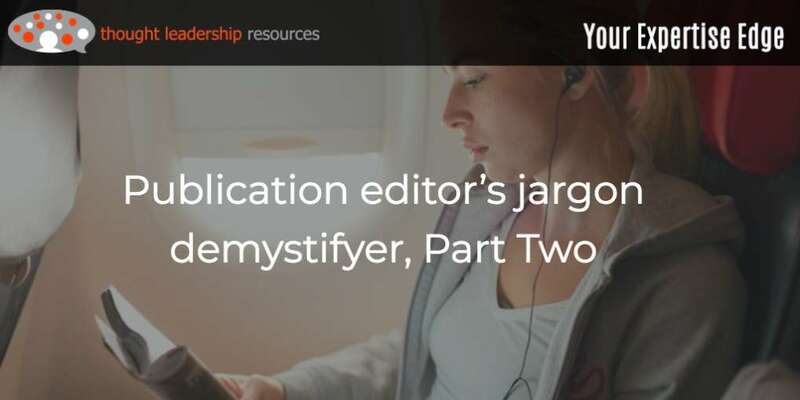 If your first language isn’t English and that’s the language you want to work in, it could be that products depending on an audio track – video, online courses, podcasts, public speaking – won’t be best for you. However, written products are more accessible, because you can have your writing proof-read and edited by someone more fluent in English. But I can’t emphasize enough how all aspects of thought leadership work together. Your videos help you get speaking gigs, because people booking speeches want to see if you’re fully human and can communicate effectively. 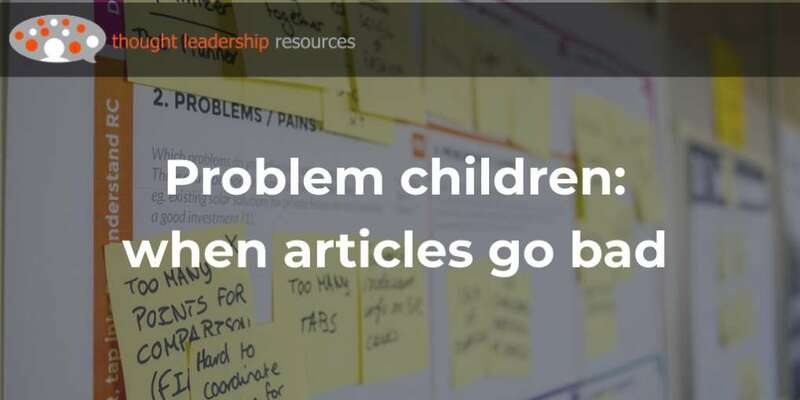 The heavy-lifting content like white papers and articles help show that you’re someone with depth. Mastering new technology like live video (I do Facebook Lives twice a week; you can catch the recordings here) shows that you’re staying up to date, meaning that your ideas are also current. So what do you think? What works for you? And can you think of any ways to make money at thought leadership beyond those I’ve mentioned? Please share in the comments.